"As the Earth filled with water, Coyote got together with Frog to make a place to live. Frog dove deep and brought up two handfuls of sand. Then Coyote scattered the sand all around and created land. Next he created pine nuts and acorns and all the other kinds of food. When he finished, he said to Frog, ' This is a good earth, and now I'll create the People to make it their home'." Look at these objects and the plants and animals interspersed among them. Indians were California's first people. Before the Spanish began colonizing the area in 1769, there were more than 300,000 Indian people here. 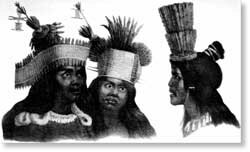 They represented over 100 tribes, a diverse collection of societies with distinct cultures and traditions. California's native people believed they were part of the land itself, part of a harmonious balance with nature. Indian people used what nature had to offer. G.M. Sandel, an early American settler, observed: The Indians were very well formed, robust, handsome people. They were partly tattooed, and wore ornaments of bone and beads. They used bows and arrows and were very expert fishermen. They gathered acorns, roots, and grass-seed. Gold has always been in California. Didn't some of California's Indians know it was here? Of course they knew it was here. It just had no value in their culture. Certain other items from nature represented value. Dentalium shells were used both as a medium of exchange and as a sign of wealth. Why would a big chunk of obsidian have been highly valued? It was used by skilled craftsmen for making knives and arrowheads that would be used for hunting, or in ceremonies. 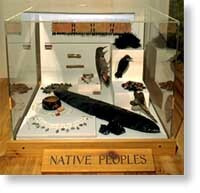 California's Indians collected seeds and acorns, hunted deer and elk, and caught salmon and grasshoppers. Whether the plants and animals were prepared and eaten as food, or harvested to make essential tools and ceremonial objects, all were nature's offerings. G.M. Waseurtz, in 1842, observed: They gathered acorns, roots and grass-seeds . . . Often we fell in with large numbers of Indians loaded with roots and acorns which they had gathered from afar. They encamped along side us. The Indians gave us some of their hard bread. It tasted like ginger bread, and seemed a very healthful food. The arrival of Europeans provoked profound changes for California Indians. In their missionary zeal, the priests set out to subjugate the Indian people by exploiting their labor, and changing their traditional culture. Disease, abuse, and the destruction of their environment spelled disaster. In the first ten years of the mission system, over sixteen thousand Indians were baptized and over nine thousand of those died. By 1817, the mortality rate among the mission Indians had risen to nearly 90 percent. In only 100 years of contact with Europeans and Americans, California's entire native population had been reduced by ninety percent, a staggering decline.